I liked its location, it was clean, good elevator and great room size with a kitchen. Staff was very nice. The staff members were very helpful, the hotel was always very clean, quiet and breakfast was plentiful. Breakfast was excellent each day. 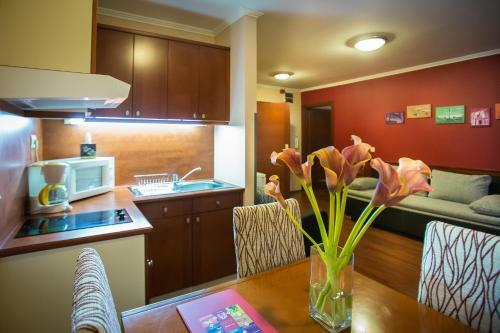 Location is just outside the main tourist area, but within a reasonable walking distance and well serviced by transit. We had no trouble getting anywhere reasonably easily, and we enjoyed walking to many places including to and from dinner each evening. The front desk staff was very helpful ( and patient). Room was basic but clean, comfortable and fully functional. Great value for the money. Excellent location, quiet room, very nice and helpful staff. 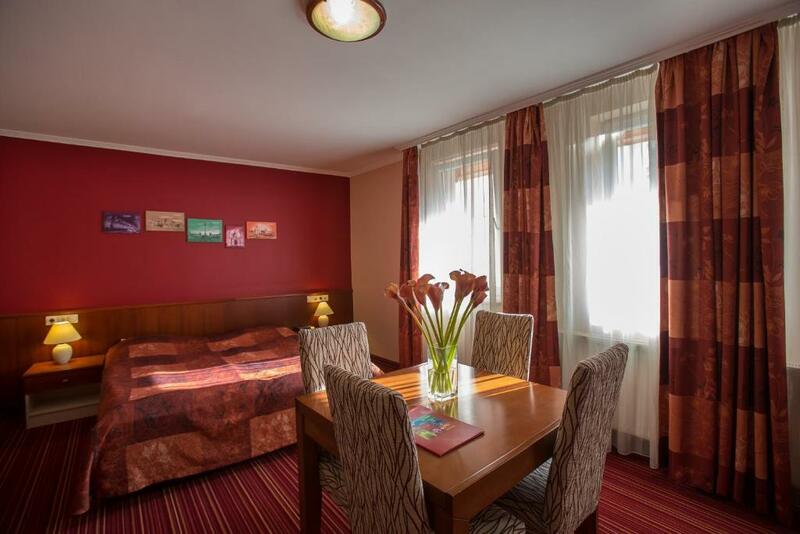 Lock in a great price for City-Hotel Budapest – rated 8.6 by recent guests! 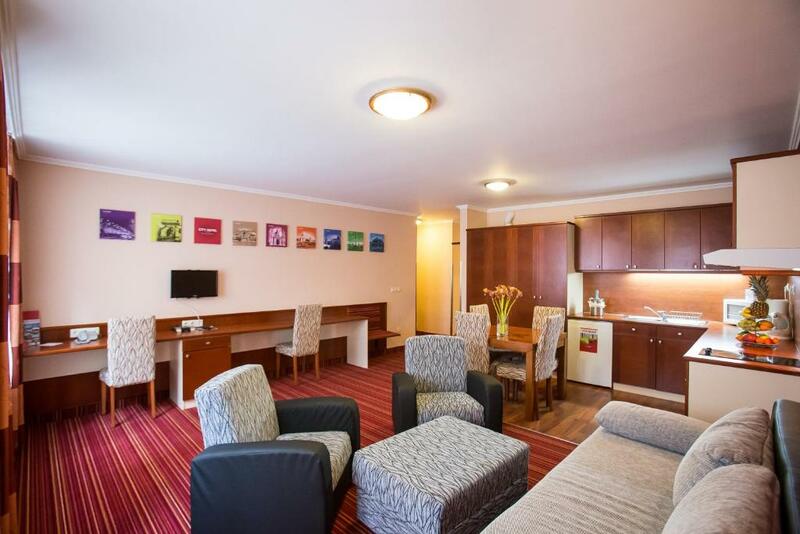 City-Hotel Budapest This rating is a reflection of how the property compares to the industry standard when it comes to price, facilities and services available. It's based on a self-evaluation by the property. Use this rating to help choose your stay! 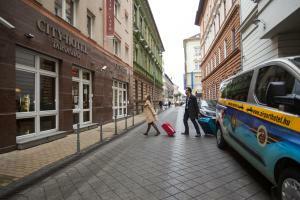 The City Hotel Budapest is centrally located, in a quiet side street of the Erzsébet Boulevard. 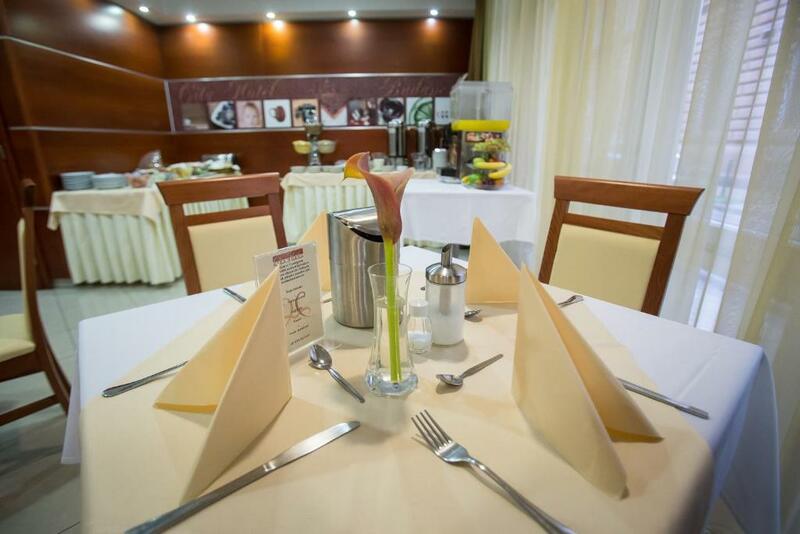 Breakfast is available and is served in the hotel's City Café. Choose from elegantly furnished apartments with daily maid service and featuring a fully equipped kitchen. Andrassy Street, the Opera and the Heroes square are just a few minutes' walk away, bus and tram stops can be found just around the corner and the next metro station is only 1,300 feet away. You can park your car safely in the City Hotel Budapest's underground car park. 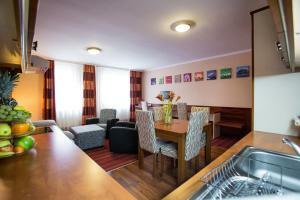 뀐 Located in the top-rated area in Budapest, this property has an excellent location score of 8.9! When would you like to stay at City-Hotel Budapest? City Hotel Budapest is located in the heart of the capital between the Blaha Lujza Square and Oktogon Square, in a quiet side street of the Grand Boulevard. Thanks to its central location, main attractions, museums, shopping and business districts, many cafés and restaurants are easily and quickly accessible on foot. Our apartment-hotel is the right choice for business travelers and families spending their holidays. Four floors, with three different sizes (three 6-bedroom, seven 4-bed rooms and 12 double rooms), 22 apartments are ready for the visiting guests. Well equipped rooms including minibar, TV, telephone, safe, free wireless internet access, air conditioning and a fully fitted and equipped kitchen. 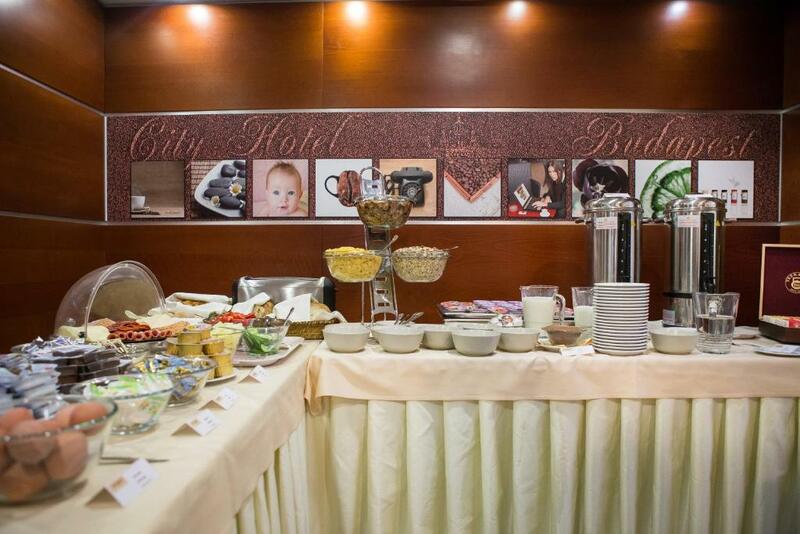 As part of our basic services, we offer buffet breakfast. For guests arriving by plane or train we recommend the use of our shuttle service, which takes you to our hotel quickly and easily. For guests arriving by car, there is a safe, enclosed garage with 30 places. We warmly welcome our future and returning guests! Thanks to our central location guests can find most services which can make their trip more enjoyable in a short walking distance. Such as swimming pools, gyms, cinemas, malls, saunas, cafés, fast food restaurants, theatres, opera, confectioneries, tobacco shops, pharmacies, laundry services, car and bike rentals and pubs. House Rules City-Hotel Budapest takes special requests – add in the next step! City-Hotel Budapest accepts these cards and reserves the right to temporarily hold an amount prior to arrival. I can't remember a thing, that I didn't like. The staff was very courteous and very helpful . Also the location is great right at the centre . Breakfast is perfect.Persons is very good. Slow Wi-Fi, indoor parking does not fit for big cars. Good location, friendly and helpful staff, clean apartment with good quipped kitchen, late check-in. The parking is not for the bigger cars. We had a apartment for 6. It was clean and spacious with a good equipped kitchen. The location is in the heart of the city and nightlife, but in a side street, so it isnt so noisy. The breakfast was good. I highly recommend. Excellent service at the reception, very kind and helping staff. Convenient location, close to landmarks and very easy to get to the hotel by publick transport. Open 24/7, if you are out at night. We had a problem with room 12 as it was just over a garage but after asking to change the reception manager helped us to have another room more quiet. It was a surprise for my partner’s birthday and we received a bottle of complimentary local wine in the room. The position is great, very comfortable if you want to move by public transports. The hotel location is excellent, on the rim of downtown, few steps to major public transport lines. The room was spatious, kitchen was also big and good equiped. Reception worked very well. Excelllent value for money. Great location, close to commercial street and New York cafe. Very comfortable rooms, suitable for individuals and families. Clean, tidy, great breakfast. Fantastic staff, friendly, helpful and effective. Perfect location. Central but quiet. we didn't have English channels on the tv . Friendly staff very clean room and lovely breakfast. location was good. Great location in the Jewish quarter close to plenty of bars and restaurants within walking distance. Close to ruins. Spotlessly clean. Decor s touch dated but I think that is just the Hungarian decor. We did not try the breakfast so cannot comment. Staff were really friendly and helpful and they organised taxis when we need them. The apartments were a good size and kitchen looked good even tho we did not use it.